is a document sent to superior authority, and comprises lists of persons or things in your charge. This document, quite contrary to what you might suppose from its title, never returns to you, unless the person to whom you have sent it thinks it requires attention. It is probably called a Return for this very reason, as it is the most unlikely name for it, and so cultivates a taste for the eccentric in the Service. is the statement in writing made by a person, usually an officer, to the effect that he has done his duty. Generally speaking, persons in the Army are presumed to have left undone what they ought to have done, unless they certify in Writing to the contrary. This may, perhaps, seem a most reasonable view to take of human frailty; but in the Army it has this drawback: that people's time is so much taken up in certifying that they have done their duty that they are obliged to omit part of that duty in order to give them enough time to certify that they have done it. They then have to send a written explanation as to why the duty in question has not been completed. This, again, causes further duties to be missed; and so the eternal round of correspondence goes on, to the detriment of the Service and the good of the stationers. This explains why such large staffs of clerks have to be kept up in the Army, and also why officers are so reluctant to initiate any new scheme, as it involves a fresh batch of certificates, which they obviously cannot cope with. There is another reason why an officer is often called upon to sign a certificate, when this involves financial responsibility. The authorities naturally like to get the signature of a man of substance and wealth to a document of this sort; so, the officer is chosen, on account of his large income, no matter whether he has an opportunity of ascertaining the accuracy of the document or no. This, again, explains the extraordinary generous scale on which the Regimental Officer is paid. Confidential Reports on officers are sent in yearly to the War Office. The object of these reports is to arrive at the character and capabilities of officers, and to bring a little amusement into the dull lives of the officials at the War Office. 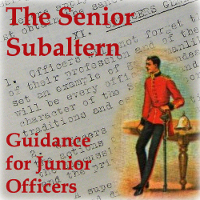 As far as Regimental Officers are concerned, their "characters" vary every time they change their C.O., unless they happen to be extremely adaptable people, when their Reports will be more or less uniform. The stronger and more consistent an officer's character is, the less likely are the Reports to be consistently favourably indeed the chances are that they will either be excessively favourable or violently condemnatory, according as the personality affects the writer of the Report. In short, it is simply a question of studying Maxim No.4. The more thoroughly this maxim is mastered and digested, the more likely are the Reports to assume a placid and colourless tone, even as the life of the officer is also placid and colourless. These Confidential Reports are rendered at midsummer, and the best of them are read out at the Annual Dinner of the War Office Officials, at the Ritz Hotel, amid huge merriment. They are usually compared with the corresponding extracts of former years, and the assembled guests are asked to guess whom each Report is on. The official who makes the greatest number of bad guesses is condemned to read and comment on the Confidential Reports of the following year. is actually what its name implies. It does not usually concern the young officer. Sometimes Captains take part in Staff Tours, but generally speaking the delights of a Staff Tour are only enjoyed by Staff Officers and Regimental Officers of Field Rank. There are generally two sides in a Staff Tour, which carry out imaginary operations against one another. These sides are started as far away from each other as possible, as, being provided with motor cars, they collide in an astonishingly short space of time. The chief object of the Director of a Staff Tour is to give employment to each individual concerned in it. Consequently the leaders of the two sides Bet their subordinates all kinds of tasks, more or less unnecessary. Sketches (see under heading "Sketch") and Reports are made with wonderful rapidity, and imaginary troops are moved with regularity and precision without any reference to the reports, etc. The evenings are taken up in writing Appreciations (see under heading "Appreciation") and Operation Orders. Matters progress fairly simply. Everyone does his task without reference to anyone else. About the afternoon of the second day affairs generally reach their climax. The two imaginary forces are now actively in collision, and the leaders of the opposing combatants are present in the flesh, explaining how they would manoeuvre their forces. The battle waxes hotter and hotter. Positions are taken and re-taken, heights are stormed, flanks turned, counter-attacks delivered; whilst the slaughter caused by the rival forces is enough to make a War Correspondent's mouth water. At last the iron-hearted Director cries "Enough." His blood-lust is sated. He makes a few remarks on the situation, showing that mistakes have been made on both sides and that neither has gained the advantage. And so home, not even stopping to bury our dead. All officers are expected to know how to make a "Sketch." This is not such a thing of art as it used to be. One is So miserably restricted in the use of colours that it is no longer possible to imitate the bright mosaics of Mar. CUB Stone or the dreamy effects of Turner. But even in this prosaic age it is possible to please in Black and White, with an occasionally bold use of Red, Blue and Brown. Of course no one would think of comparing a present-day sketch with the best of the older works. I have a little "gem" of a sketch, entitled "Frimley Heath," executed during the closing years of the nineteenth century and which is believed to be the last of the Victorian School, which reached its apogee at Sandhurst in the eighties. It is painted in eighteen different colours, and would be cheerfully conspicuous anywhere. One might say it was very flattering to Frimley Heath--but then the object of true art is to please, not to produce a slavishly accurate representation of the original. I am presenting it to the Hospital for Consumptives at Frimley, to brighten the lives of the patients. But these Old Masters must not be imitated to-day. There has been a notable reaction towards a dull and literal school of art, and the only way to placate the authorities is to produce a thing which is really not much better to look at than an Ordnance Map. In fact, in most cases the "sketch" is veritably taken from the map--usually enlarged--and after being slightly decorated and embroidered, is considered fit for use. The great art in making a modem sketch is to know what to leave out. This makes for rapid work. Roads, railways and rivers must be boldly drawn. Contours can be guessed. If any space looks very blank, fill in with trees, or write "heath," "marsh" across it, or draw an arrow from it to the side with II commanded by enemy's artillery fire from-at- yards." Fill in the sides as follows: In large letters along the top, write the title of the sketch (this should take up about one-third of the total space). On the right side fill up with North and Magnetic arrows, about 8 inches long, or more. Along the bottom place the scale and your signature. If much room has to be filled up, the signature may be very bold and gracefully finished, giving rank, regiment and date on separate lines. If you consider even more can be taken, "Form lines at 1,000 feet" may occupy another line. The left side of the sketch may be filled in with remarks on the weather, and the state of the ground. A sketch executed on the above lines is certain to attract attention. This expression is in constant use in the Services. It implies a premonition on the part of the user of the expression that there will be failure. It usually accompanies an order given in writing, such as "Officers proceeding to the United Kingdom on leave of absence from service abroad will report themselves without fail to the Military Secretary, War Office." Such an order as the above is, of course, foredoomed to failure, and the insertion of the words "without fail" only aggravate it. It follows from the use of the words "without fail" that the authorities do not expect officers to carry out an orders indiscriminately, but expect them to use a wise discretion in selecting those orders which it would be as well to obey. Without this well-understood licence, the King's Regulations would be unbearable. (3) To test the Regulations. (1) and (2) are self-evident. As regards (3), if an officer succeeds in proving himself in the right in spite of the Regulations, the Regulations are promptly amended. To those who find difficulty in giving their reasons in writing, owing to lack of imagination or training, the following hints may be of service. Unless the matter is a decidedly serious one the simple phrase "Error regretted" may end the correspondence. This need not commit you in any way. It does not necessarily imply that the error is yours, and might even be taken to mean that the fault lies with the officer who asks for your reasons. It is possible, of course, that you may still be pressed for an answer, but you should have been able to think one out by this time. If the matter is a really serious one, get expert advice, and quote I'-S many regulations and authorities as you can. For instance, you are asked to give your reasons in writing as to why Pte Fish had a blister on his left heel when the G.O.C. inspected his feet. Something in the nature of the following would probably meet the case: "Reference Pte Fish's blister, King's Regulations para. 588, as amended by A.O. 233 of 1st April, 1916, appears to place the responsibility for reporting blister on the soldier, unless the blister has developed sufficiently for the officer to be able to detect it easily with the naked eye. Northern Command Circular Memorandum C.R.N.C. No. AI44561 dated 10.10.01 specifically exonerates officers from all responsibility for water blisters. Pte Fish's blister would appear to come under this latter heading. The blister has now been tapped, and Pte Fish has promised to undertake that no further unauthorized blisters shall be permitted to appear on his feet." The advantage of this method is that it becomes a contest in quoting and misquoting regulations, the original question being lost sight of. This is merely a polite way of stating an undeniable and possibly unpalatable, fact. The phrase "it would appear that you have been misinformed" simply means "somebody's been pulling your leg." It is a very useful expression, and enables one to be politely impertinent to one's superiors. It is advisable, however, to refrain from making use of it in this way, unless the superior has no chance of hitting back. The expression is constantly used when quoting Regulations. Thus, say the issue of a pair of spring-heeled, as against web-footed, boots is called in question by the Seers of the Ordnance Brotherhood, or perhaps by the High Priest himself. Your only chance is to fly to the Sacred Books as a fugitive to the Sanctuary in olden days. Your dubious reply would work out somewhat as follows: "Clothing Regulations para. 998 lib Appendix V (iv) as amended by Army Order No.228 d/10/10/12 would appear to allow tills issue, on the conversion of a Special Reservist to a Regular, vide Eastern Command Circular letter E 3456 dated 12/10/12 forwarded under No.9 District P 22,345 dated 13/10/12." "It would appear that Extra Special Reservists do not wear boots, ammunition, armour-plated, web-footed. ;&.9 they appear to be intended for fighting purposes, vide S.R. Regulations para. 28, Clothing Regulations para. 1,009 subsection 3(b) and C.R.N.C. No. 9,654 dated '9/9/09." The thing that matters to the authorities is not so much whether you have reason on your side as whether you have the Regulations on your side. It is, of course, almost impossible to have both on your side, and if you wish to succeed in the Service, you must learn to stick to the Regulations, and finally abandon all reason."